The iPhone is selling by the bucketload and iPads and MacBooks are essential tools for the sorts of attractive twenty-somethings who tend to appear in adverts… But Apple TV? As far as we can tell, though Apple TV has sold pretty well, it hasn’t changed the living room, let alone the world. So in a bid to gin up some interest Apple has decided to take a lesson from Netflix and Amazon Prime’s playbook, and develop some original TV content. Forget mega-budget Kevin Spacey political dramas though, and cast aside any thoughts of Jeremy Clarkson and his pals spending the big bucks making a travel show that pretends to be a car show. Apple has decided that the best vehicle with which to launch its ambitions is… a rip off of Dragon’s Den. That’s Shark Tank, if you’re American. Planet of the Apps – yes, that is really what it is called – will see budding entrepreneurs pitch their idea to an “expert panel” which includes Jessica Alba, Gwyneth Paltrow and ubiquitous failed tech entrepreneur Will.I.Am. We know what you’re thinking: we don’t know what secrets Will.I.Am knows about Tim Cook either. But we know what you’re also thinking: Why is Apple, the biggest company in the world, with one of the coolest brands in the world, deciding to cash in all of its brand equity on such an obviously tacky idea? So we’ve decided to help Tim Cook. We can’t pinpoint the exact psychological reason why he’s decided to greenlight this, but we do watch a lot of TV. So here’s our suggestions for five other TV shows that Apple should have ripped off instead. Apple, like all tech companies, obviously wants to present itself at the forefront of innovation. So why not produce a show that explores technological innovation around the world? One format to rip-off that does this rather nicely is “Hello World” on Bloomberg. In each episode Ashlee Vance visits a different country and meets local start-ups and tech firms. And for tech nerds, it makes for fascinating viewing as it shows what is going on not just in Silicon Valley, but elsewhere. For example, in one Russian city that was deliberately created for scientists in the Soviet era there is now a cutting edge drone company building devices that can compete with the rest of the world. So why doesn’t Apple play to its’ strengths and send a filmmaker around the world to capture what’s going on? Hey, they might even discover some start-ups to buy along the way. W1A was a critical hit for the BBC when it aired in 2014. The satirical mockumentary brilliantly pierced the pomposity of the corporation that commissioned it as it followed the work of “Head of Values” Ian Fletcher (Hugh Bonneville) at BBC Broadcasting House itself. It showed that the BBC, despite its long and august history as an institution in British life, was not as po-faced as we might have expected. Apple, meanwhile, is another massive organisation – wouldn’t it be nice if we knew it could laugh at itself too? There’s plenty to mock: The circus that is a keynote presentation, the way Jony Ive will earnestly discuss the shape of a button (not to mention the fact that Apple has become something of a religion amongst its most zealous customers). 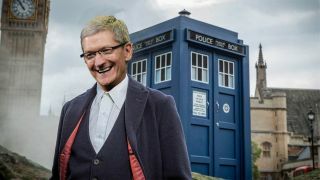 Paul O’Grady could be cast in the role of Tim Cook. Perhaps it is time that Ian Fletcher got a new job in Cupertino? Before Planet of the Apps, the company’s only previous foray into original content has been with it’s Beats 1 online radio station. Sure, it doesn’t appear as though anyone is actually listening to it, but at least the station, under the sage guidance of former Radio 1 tastemaker Zane Lowe fits in with the brand values that Apple is trying to project: “Look at all of this achingly cool new music from credible artists that you can listen to on your Apple Device”, Apple’s marketing has shouted since the original iPod. Arguably the closest analogue on TV is the BBC’s Later, in which Jools Holland manages to round up a bunch of credible musicians to play some music together. There’s few gimmicks, and it doesn’t need them – it’s for musos with eclectic tastes. So what Apple should do is obvious: Super-charge this format. Use the iPhone’s money printing machine to book the biggest artists, mix it up with some cool obscure people and have inexplicably cool 43 year old Lowe present. Perhaps leave out the boogie-woogie piano. Make it credible, maybe throw in a few interviews focusing on musicianship and all of a sudden Apple is the producer of a global tastemaking music show. In the 20th century, the US government granted the TV networks the airwaves for free, on one condition: That every night, they broadcast the news. Perhaps it is time for Apple to step up as a responsible corporate citizen in the 21st century and do its duty to inform citizens too. Let’s face it - it’s very hard to tell what’s true anymore and it’s partially Apple’s fault. “Fake news” is a much abused term, but the simple fact is that thanks to the proliferation of internet-capable devices, everyone is able to live in their bubble, hearing only facts and opinions that they want to hear. And while it might be pleasing to have everything you read reinforce your existing views, this is a terrible, terrible thing for democracy. At the same time, the internet has destroyed many of the business models of journalism: Foreign bureaus have closed, court and local news reporting has virtually disappeared. Why can’t Apple use its billions of dollars it has on hand to form a major news organisation? Produce a nightly bulletin that lives up to the values that Will McAvoy in The Newsroom would espouse. And finally, perhaps what Apple TV needs is something that caters towards a major demographic in its fanbase: They need a show about a geekster with lots of gadgets. Simply drop the TARDIS and replace it with an Apple Time Machine and instead of a human companion, simply have The Doctor banter with Siri instead. There’s lots of scope for varied villains too: A seemingly all knowing entity known as Google, and Samsung, a South Korean monster that causes explosions. And if Apple wants it’s Doctor to remain totally on brand: Make the Sonic Screwdriver charge up with a proprietary connector too.